Car auction specialist G3 Remarketing has pledged to cover the cost of employing a Prince of Wales Hospice nurse – for the second year in a row. The £40,000 donation will help the charity to continue supporting people with life-limiting illnesses and their families. This is the latest in a series of fundraising drives from G3, which first began in 2010 when director Matt Dale completed four marathons and an ultra-marathon to raise valuable funds for the hospice. But wanting to take this support even further, the firm as a whole has since donated over £100,000 to the worthy cause. The funds supplied by G3 last year made extra money available elsewhere at the hospice – allowing the nurses to care for more people with complex conditions. The team has also begun replacing all beds with high tech models that can be programmed to allow patients to turn and move more freely around their rooms – as well as reducing the number of falls. In addition to this, senior nurse Mandy Metcalfe has been able to undertake specialist training in ‘Palliative Care Concepts and Practice’, which has enhanced both her and the team’s knowledge of how illnesses can impact holistic needs. Matt is also the honorary founder of the charity’s ‘Club 5’ – created last November for businesses of all sizes that want to give something back to the hospice. The initiative asks companies to pay a membership fee of £250+VAT per year, which grants them access to exclusive quarterly networking meetings, where they can connect with like-minded firms and businesspeople. 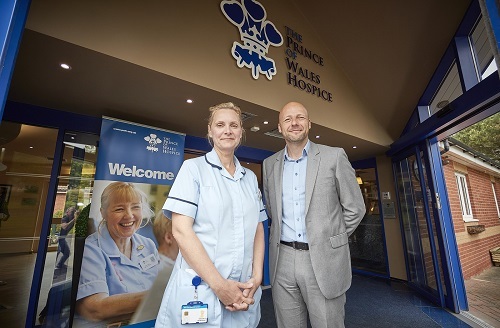 The Prince of Wales Hospice was founded in 1989 and helps over 300 in-patients per year. An additional 1,000 people also receive support and advice from the facility through day therapy sessions and lymphoedema clinics.